The most unsuspecting of these videos do, there are certain videos posted by unknown individuals that just catches fire, and they go absolutely bonkers viral, and at times for no reason. The majority of these videos, however, are usually captured and calculated in design, while some posted are just pure fluke when they get millions of views. The basic elements of a highly successful video which goes online are done so, by just tapping into a few fundamental principles of human emotion. When you’re creating your own videos, you can apply these same principles to duplicate any type of communication form, such as your marketing efforts or to boost your brand. While it remains a “hit and miss” science project that anything will ever go viral, with absolutely no guarantees, but if you investigate, study, and then apply the core basic elements, doing so can significantly increase the chances of engagement and impact. The production of imagination on video can be an expensive and a time costing proposition, as these marketing pieces take diligent planning, so it would be in your best interest to make it count as much as possible. There are a few primary elements when it comes to the human emotion which makes them react on cue. These are the basic factors which should be used when making your videos to go potentially wild. • Give Me Just A Bit Of Emotion – We live in a world that’s obsessed with obligations, productivity, and boring metrics. What people long for are opportunities where they can somehow reconnect with their humanity. What everybody wants is the injection of anger, romance, disgust, nostalgia, joy, ambition, and other feelings which pumps up their blood, reminding them that they’re human, and then motivating them to connect emotionally at a deeper level. • Make Sure That You Validate Yourself – What you need to have is a significant amount of common ground when it comes to your target audience, this in order to effectively spread what the message of your brand or product is. People will generally share with others things which validates their own views and opinions, and what represents or reinforces their own beliefs. For instance, if you take a look at your Facebook news feed, what you’ll see is a lot of this, posts which you’re attracted to or believe in. Likewise, these same individuals will automatically and instantly dismiss messages which contradicts their views. For the majority of the time, you can’t typically make people care about something that they don’t care about already, but you may be able to somehow help them alter their existing point of view. Focus just on the individuals who already has compatible beliefs, and then show them different ways in which your product, brand, or service can be a way of communicating or extending those beliefs. • The Style In It – The style which your message projects and is presented should be in a distinctive and sensory method, it’s easier for those viewing the video to remember, once it comes to thinking about it, once it comes to related subjects later. The fashion that something is delivered becomes the key identifying feature and characteristic which helps them recall it later, or recommend it to others. It’s similar to they remembering certain people because of the way that they happen to dress or speak. • The Element Of Surprise – Our brains enjoy the occasional shock factor as it’s wired to pay close attention and will react to anything that happens to violate their expectations. So make sure that you make your message stand out and be memorable, this by doing something in a surprisingly unique and different way, whether you use an unusual image or vivid colors, or a bold statement, make sure that it’s an unexpected outcome. • Be As Relevant As Possible – Recapture your messaging and brand prominence in a way which is directly relevant to your targeted audience. Think about their point of view, their perspective, rather than continuously focusing on the message which your organization wants to portray. • Show Your Intensity – Since there are so many forces which are continuously vying for everyone’s time, it then becomes increasingly important to somehow grab the viewers attention as soon as possible. What’s required is for you to keep that attention through brevity as well as density. Whatever your message is, whatever you have to say, cut that in half, and then half it again. Remove the excess filler words by making each and everyone count, and then leave them thirsting for more. If you think that you’ve said all that you want to say, then your message is most likely still too long, so chop and be concise. To find different ways of significantly improving your current marketing efforts, you should be considering just one marketing piece at a time, and then see how it stacks up against the other criteria. Although you can’t expect your video marketing piece to suddenly be shared and go madly viral overnight, you should be able to see that by using these basic elements in your marketing efforts, you could potentially punch up its effectiveness. You should be able to experience better results than if you don’t bother using them at all. 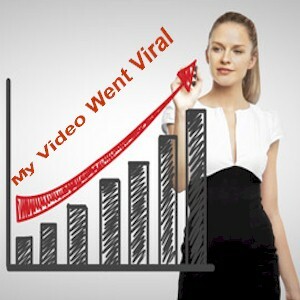 There’s also no need for a humongous budget, since all that you need to know is what potentially works and what doesn’t when it comes to your video going viral.